European Central Bank: Trump Tariff Move 'Dangerous' - Integration Through Media ....! (VOA): Europe's top monetary official criticized U.S. President Donald Trump's proposal to put tariffs on steel and aluminum imports as a “dangerous” unilateral move. Mario Draghi, the president of the European Central Bank, said that the “immediate spillover of the trade measures … is not going to be big.” But he said such disputes should be worked out among trade partners, not decided by measures initiated from one side. Trump is expected to announce by the end of this week tariffs of 25 percent on steel and 10 percent on aluminum. Trump has long singled out China for being unfair in trade practices, but experts say the tariffs would hurt U.S. allies Canada and the European Union far more. Draghi warned that unilateral moves like these tariffs could trigger retaliation — which the EU and China, among other, have already threatened. 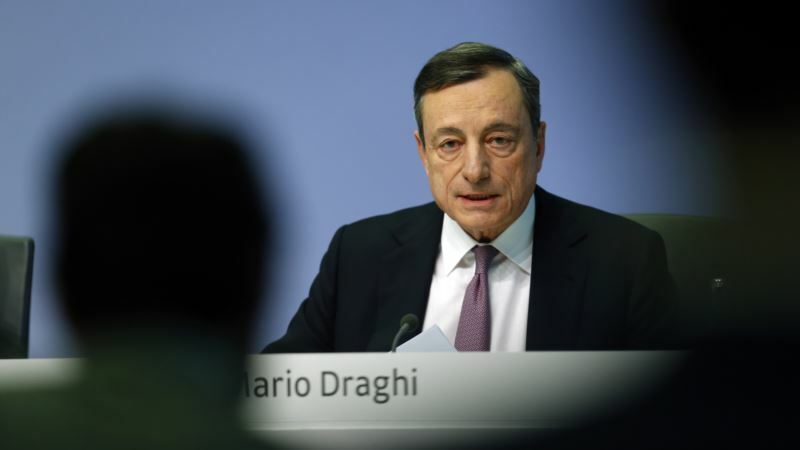 The most important fallout, Draghi said, would be if tariffs raised fears about the economy. They could depress confidence among consumers and businesses, he said, which could weaken both growth and inflation. Draghi also alluded to the kind of financial deregulation the U.S. is pursuing as a risk to the global economy. The U.S. Senate is considering a bill that would remove some of the banking safeguards imposed in the wake of the 2008 financial crisis and the collapse of investment bank Lehman Brothers. The bill is sponsored by Republican Sen. Mike Crapo of Idaho but has attracted several Democratic sponsors as well. These uncertainties overshadowed a monetary policy announcement by the ECB, in which it hinted it is closer to withdrawing a key economic stimulus program. The bank left unchanged its key interest rates as well as the size of its bond-buying stimulus program after its latest policy meeting. But in its statement it omitted an earlier promise that it could increase its bond-purchase stimulus in size or duration if the economic outlook worsens. Draghi downplayed the step, saying it was a “backward-looking measure” that no longer fit today's circumstances. Economic growth in the eurozone hit a strong annual rate of 2.7 percent in the fourth quarter, making the prospect of added stimulus remote. The bank has said it will continue buying 30 billion euros ($37 million) in bonds per month through September and longer if needed — but has given no precise end date. The eventual end of the stimulus will have wide-ranging effects. It could cause the euro to rise in value against other currencies, potentially hurting exporters, and it could bring higher returns on savings as well as stiffer borrowing costs for indebted governments in the 19-country eurozone. It should make it easier for people and companies to fund pension savings. But it could make richly valued stock markets less attractive relative to more conservative holdings. The euro was volatile after the ECB's statement, first jumping and then falling back to $1.2333 by end of day. The stimulus program pushes newly printed money into the economy. That in theory should lower borrowing rates and raise inflation and growth. But while growth has bounced back, inflation has been slow to respond. It remains at 1.2 percent, stubbornly below the bank's goal of just under 2 percent, the level considered best for the economy. The bond purchases were started March 2015 to help the eurozone bounce back from troubles over government and bank debt in several member countries including Greece, Ireland, Portugal, Cyprus, Spain and Italy. The economy is now doing better, but the bank has moved cautiously in ending its crisis measures for fear of roiling recently volatile financial markets.